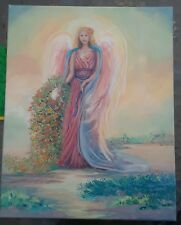 Original Guardian ANGEL oil painting 14" X 10" UK artist. The painting you see is the Painting you will receive. THIS IS NOT A PRINT. Painted on thin 2.5mm Rigid Canvas Board. Dark angel watercolor painting. 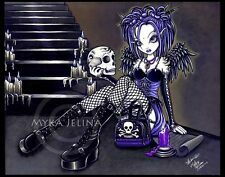 This dark, goth girl painting was created by using black watercolor, white acrylic paint, and silver acrylic marker all used on 8x10 watercolor board. This painting is matted with white matting and comes in a lovely ornate frame. The 11x14 frame is black with burgundy and silver accents. The silver in the frame accentuates the silver in the painting. You can hang this by using the sawtooth hanger on the back of the frame. Angekliedet und Vorbereitet or "Dressed and Prepared in English, is an oil on canvas painting by JCJGR. JCJGR is an RI based artist who focuses on empathetic monsters and weird creatures. His work is inspired by nightmare, horror and industrial machinery. Limited edition silkscreen print by illustrator Jason Goad. 3 color silkscreen print measuring 9” by 24” limited to 200 pieces. The size is approx. 5.25" x 19" and the wood is naturally weathered and uniquely flawed. Making it OOAK from the piece of wood to the hand painting. 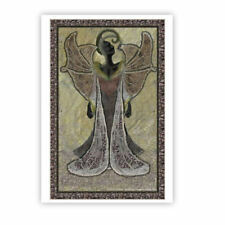 Angel with long dark hair, angel wings with white, black,, blue, sienna, red and cream. Organica has a strong dignified presence that seems to radiate energy. She is created as a reminder of our dependence on a healthy planet and of our vital part in ensuring a strong, healthy eco-system. There are many online videos showing how to do each step of this process. So as to seal in the paint and protect your art piece from dust, you can put several coats of acrylic varnish on it with a sponge or paint brush. This is not a print, this is 100% hand painted oil painting on canvas by famous painter. this is a high quality handpainted oil painting. Condition : High quality, 100% hand-painted oil painting. We hope that we will cooperate with you in the future. 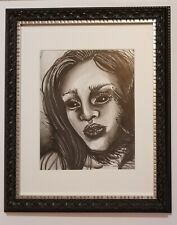 Original Prison Art, Pelican Bay State Prison, Fallen Angel, 10 x 13"
This is an original ink drawing from Pelican Bay State Prison in California. This piece is signed by the artist, Ian Whitson. The drawing was done on a large manila envelope (10x13"), in black ink. Shipping is USPS priority mail with tracking. Original Papercut "Spring in a Flower Pot" by Lithuanian Traditional Artist. Odeta Tumėnaitė-Bražėnienė (born in 1964) is Lithuanian folk artist, creator of paper-cuttings and graphics. · In 2007 awarded as a best folk artist in fine arts of Lithuania, the Golden Wreath (the most important award in traditional Lithuanian art). Sold by the artist! When properly cared for these prints will resist fading for generations! Brilliant colors and razor sharp blacks! Myka Jelina (Born 1973, in Gastonia N. Carolina) is a traditional Gothic fantasy artist appreciated and displayed by art lovers worldwide. • This is an Original oil painting. This painting is not ready to hang. Materials used: Oil Paint, oil and acrylic paper. ===================== CONDITION: new, good, see pictures =====================. The colors are black, white, gray, gold, bronze, and pearl. If you look at the photos you can see how it shines in the light. Adele Brazenaite is one of the most well known young Lithuanian folk artists. She has won a Silver Wreath (the highest award given to a young traditional Lithuanian folk artist). "Girl Angel". Original Bic Pen Drawing "In the Clouds"
Done with Bic Pen on watercolor paper. Art type: print on canvas by artist signed. -Material: print on canvas by artist signed fine art. bedroom, guest room, office. Number 5 of 1000 20x16 Matted Signed "Current See" by Penuel The Guiding ANGEL and Hezelelponi Crystal Angelheart this is how this message was created While meditating and chanting the rhythm of creation eyes closed Penuel guided my arm and hand and thoughts drawn on 4x6 HP photo paper with colored ink piece by piece as the image is colored like a puzzle the beautiful message of Thee Angel Penuel is revealed in the living images. I will try to solve all the issues. But these are very rare and isolated cases. Piece is penciled in shades of blue, white, light flesh, red, and black. This piece was sketched out long before it was finished. Most of the story is based on his battles with the Deamon and the Devil's Daughter and his search for love. I start out using my fingers and bring in a palette knife in the process. Until then. Angel Spirit painting. Guardian angel flowers. Painted with love and care from my imagination. This is a one of a kind original. Please contact me with questions! Original 16×20 Acrylic on canvas signed Robin King artist. Original oil painting on canvas 20"x16" by Vlad Pronkin 2017 " ABOVE THE CITY ". Most of my dreams are turned to canvases. I paint the things I hear and have a sensation of. My pictures have defiant boldness, they pass through a set of variations: from the initial creative principle and develop into increasing power where images will turn with the energy of my hand, my brush, and then will expand beyond all conceived. Original oil painting on canvas 20"x16" by Vlad Pronkin 2017 " DREAMING ANGEL ". Most of my dreams are turned to canvases. I paint the things I hear and have a sensation of. My pictures have defiant boldness, they pass through a set of variations: from the initial creative principle and develop into increasing power where images will turn with the energy of my hand, my brush, and then will expand beyond all conceived. An Original Painting by Onute Juskiene. Item No oj005. "WHITE ANGELS". If there is a delay in dispatch we will notify you as soon as possible. ORIGINAL oil painting by VLAD PRONKIN. Kind regards, Artist Vladimir Pronkin. I attempt instead to encourage new creations, outside of the fenced world of perceptual experience; to convert dreams of reality to the reality of life. By CLAIRE MCELVEEN. TITLE : "GUARDIAN ANGEL " 24"x 36" x. 75". SOUTHERN ABSTRACT PAINTER. ABSTRACT ORIGINAL OIL PAINTING. Gallery wrapped canvas, with staple free painted edges and a gloss protective varnish. (MONICA BLATTON. No reproduction or distribution allowed without permission. Original hand-painted oil painting on canvas. CANVAS SIZE: 12" x 17.7". I have been painting mostly oils art. Sorry about that, but do not like to write about yourself so much - never know what :) I prefer to speak through my paintings. Pinterest- McElveen Studio. My signature and the painting title signed on the front. I have sold thousands of artworks to collectors all over the world. "ANGEL AND MOON". contemporary art Russian OIL painting original ON CANVAS 21"х18,5" by Vlad Pronkin 2018 . The brush literally performs the role of a magic wand, structuring the flow. When buying from an artist / maker you're buying more than just an object / painting. ♥ Printed with archival inks on thick archival 100% cotton premium fine art watercolor paper. ♥ I handsign the picture, and sign with title. ♥ 9" X 12" including a small border for framing. Original oil painting on canvas 34"x26" by Vlad Pronkin 1999 . "2 ANGELS". Kind regards, Artist Vladimir Pronkin. ORIGINAL oil painting by VLAD PRONKIN. Most of my dreams are turned to canvases. All artworks displayed on this website are unique and one-of-a-kind abstract modern paintings. I love using myriad of vibrant colors, textures, abstract shapes and forms. I work only with highest quality art materials, and paint on acid free artist quality stretched canvas. Item: Cherub Planter. Color: Antique Sandstone. Material: Tough Stone. Great quality and great price. Quality canvas print on stretched canvas. Size: 16"x20". Professional gallery wrap. Star Fire angel is from my original design. A reminder that we are never alone. A call to pray daily. Hand enhance and signed. Professional gallery wrap. Angel Fire is from my original drawing. A reminder that we are never alone. Wizard of Oz was my inspiration. Hand enhanced and signed. Quality canvas print on stretched canvas. The size of the painting is approx. The wood is naturally weathered and uniquely flawed. Making it OOAK from the piece of wood to the hand painting. Angel, short dark hair, angel wings with white, black, aqua, blue, yellow and and cream.